Then I Realized … I Am Somebody! 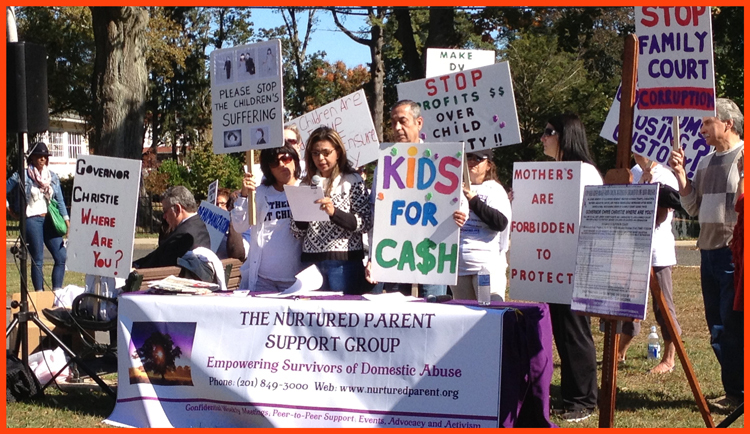 JOIN OUR NURTURED PARENT REVOLUTION! You have value. You have purpose. You have rights. where your healing and conscious awakening can begin! The Nurtured Parent’s mission is simple: PROTECTING CHILDREN. EDUCATING THE PUBLIC. EMPOWERING SURVIVORS. While our spoken mission may be simple, the task at hand is very difficult. Despite the obstacles our vision remains clear, ensuring the protection of the rights, safety, health and well-being of our nation’s women and children. FAMILY COURT IS A $50 BILLION DOLLAR INDUSTRY. Domestic violence and sexual abuse perpetrators are winning joint and even sole custody of the children they harm. Safe, loving, care-giving parents are prevented from protecting their children by family court and child protective services, and they are being punished for attempting to do so. Help raise awareness about domestic violence and court-ordered abuse by liking and sharing our website via social media! The most valuable way to “spread the word” is talk about it, make it viral and let the public know what is happening. The Nurtured Parent can be found on FACEBOOK and TWITTER. The Nurtured Parent would not be possible without the generous support of people like you. By making a DONATION TODAY, you will immediately assist those in need and further support a grassroots movement that is raising awareness about the epidemic of injustices against women and children in the family court system. Together, we can turn grief and loss into something positive; BY CONTRIBUTING, WE CAN PREVENT FUTURE DEATHS. There are victims (and their children) in life-threatening situations right now whose tragic outcomes could be altered by increased preventative measures such as evaluation of high risk cases, public education, and holding abusers accountable. The public can’t protest what it doesn’t know! DONATE TODAY and help correct our broken judicial system, assist our abused victims and fight to make our communities safe again. We need to PROTECT them … help us ADVOCATE, help us get rid of UNETHICAL judges who intentionally fail women and children for money! The RIGHTS, SAFETY, HEALTH and WELL-BEING of our nation’s WOMEN and CHILDREN must become our TOP PRIORITY in LAW and SOCIETY. STOP New Jersey Judges from forcing defenseless children to be harmed by AB– USERS! STOP allowing MONEY to drive their decisions! STOP the endless cycle! There are so many MISCONCEPTIONS about the FAMILY COURTS. We EDUCATE, we SUPPORT and we want to SPREAD THE TRUTH. We are not alone and neither are you! You can become an active part of our fight against the justice system. Find out where, when and how you can participate on our Activist Bulletin Board.